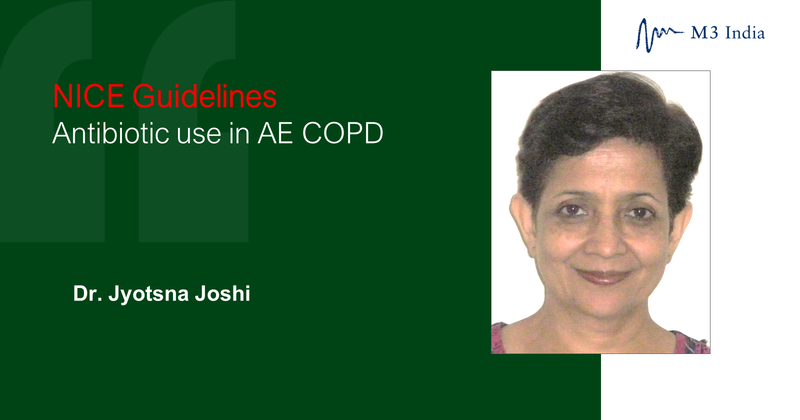 Dr. Jyotsna Joshi expertly summarises the recently updated NICE guidelines for appropriate antibiotic use in COPD exacerbations; acute exacerbation being a common occurrence in the natural course of COPD. Acute exacerbation of COPD (AE COPD) is a common occurrence in the natural course of the disease. The frequency of exacerbation determines the therapy as per GOLD (Global Initiative on Obstructive Lung Diseases) guidelines combined assessment scoring. This uses the severity of symptoms and annual exacerbation rate. Inhaled corticosteroids are indicated in severe cases. Most exacerbations are due to bacterial infections. National Institute of Health and Care Excellence (NICE), UK has provided guidelines for appropriate antibiotic use in COPD exacerbations. These are appropriate for the Indian scenario too. An exacerbation is a sustained worsening of the person's symptoms from their usual stable state, which is beyond normal day-to-day variations and is acute in onset. Commonly reported symptoms are worsening breathlessness, cough, increased sputum production and change in sputum colour. The presence all 3 symptoms was defined as type 1 exacerbation; 2 of the 3 symptoms was defined as type 2 exacerbation, and 1 of the 3 symptoms with the presence of 1 or more supporting symptoms and signs was defined as type 3 exacerbation. Up to 50% cases of AE COPD are due to bacterial infections. Therefore, antibiotic use should be selective. From the evidence identified, the committee agreed that it was not possible to identify which people with an acute exacerbation are more likely to benefit from antibiotics. However, from their experience, and based on existing expert consensus, the presence of sputum colour changes and an increase in volume or thickness beyond the person's normal day-to-day variation appear to be important factors. It is common practice in India to initiate antibiotics and that too of higher class frequently leading to expanding drug resistance. The guidelines recommend basic antibiotics that have good activity against common pathogens, such as Streptococcus pneumoniae and Haemophilus influenzae and for short duration of 5 to 7 days. Incidentally, oral corticosteroid use in the form of prednisolone 40 mg single daily dose for 5 days has now been recommended based on studies in addition to antibiotics and bronchodilators. Note: A person is receiving antibiotic prophylaxis, treatment should be with an antibiotic from a different class. The committee agreed that a sputum sample should be sent for culture and susceptibility testing if symptoms have not resolved following antibiotic treatment and this has not been done already. Specific organisms, such as Pseudomonas aeruginosa may need to be looked for if people have prolonged recurrent exacerbations. People who may be at a higher risk of treatment failure include people who have had repeated courses of antibiotics, a previous or current sputum culture with resistant bacteria, or people at higher risk of developing complications. It is recommended restricting the use of fluoroquinolone antibiotics following a review of disabling and potentially long-lasting side effects mainly involving muscles, tendons, bones and the nervous system. Also, there is potential to create drug-resistant tuberculosis. Hence these should not be used for mild or moderately severe infections unless other antibiotics cannot be used. Co-trimoxazole should only be considered for use in acute exacerbations of COPD when there is bacteriological evidence of sensitivity. Review intravenous antibiotics by 48 hours and consider stepping down to oral antibiotics where possible.